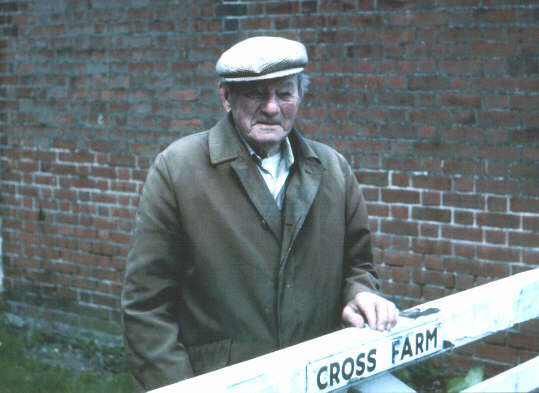 A familiar sight, Claude Watsham standing at the gate to Cross Farm in the 1990s. 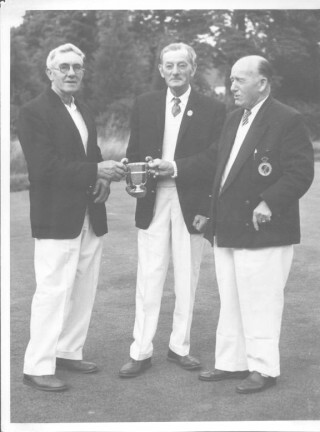 Claude Watsham (centre) with two other members of Wivenhoe Bowls Club, Mr H.Green (left) and ??? Frederick Watsham came to Wivenhoe from the Alresford area in 1902 when he bought Vine Farm from a previous owner who had run into debt. He became a respected person in Wivenhoe, was elected onto the Wivenhoe Urban District Council and served as Chairman in the Council year 1927/28. His son Claude was born in 1898; one of three boys and four girls. 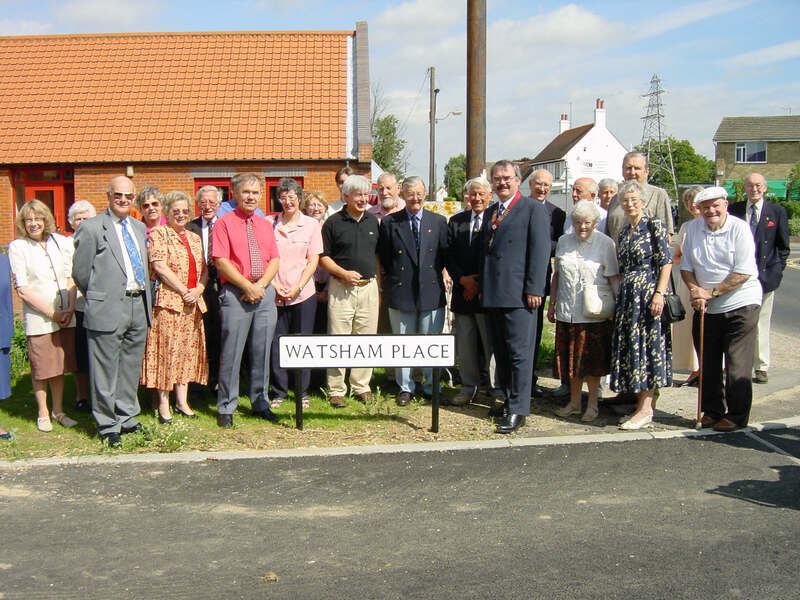 At the time of World War One starting in 1914, the ages of the young Watsham’s would have ranged from 20 down to 10. Elder brother Harold had joined the Territorials, and so was called to fight early on. He went out to Gallipoli with the 5th Essex, landing at Sulva Bay. He won a DCM for some rescue mission, but lost two fingers in the process. After Gallipoli, they were sent to Palestine. At the age of just sixteen, Claude volunteered to join the Army to fight in the 1914-18 War. Before leaving, he asked Mr Charles Gooch, the owner of Cross Farm, the farm across the road from Vine Farm, if he might take over the tenancy of Cross Farm when or if he returned from the War. He survived the War, although injured by machine gun bullets at the Somme and his hearing was also impaired from the fighting. Soon after the War, Claude and his great pal, Lennie Warner, who lived at the top of Rectory Hill, booked a passage to Australia with the intention of emigrating. At the last minute however, Cross Farm became vacant and Lennie went on his own. 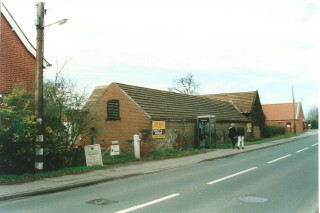 Cross Farm was a typical farm with cattle, free-range chickens and arable crops. Before the second World War, milk was collected daily from the farm and taken by cart to the bottom of Wivenhoe where it was sold and also turned into butter. 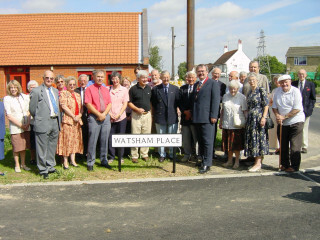 Between the Wars, the Watshams were well known in Wivenhoe which had a population then of around 2,500 people. Claude managed to live most of his long life at Cross Farm, and only in his last couple of years was persuaded to move into a bungalow, across the road in Lammas Way, on land once part of Vine Farm. He died in 1988. His wife Freda lived on, after 68 years of marriage to Claude, and celebrated her 100th birthday on 6th December, 2000. She died in March 2001 after spending the last few years of her life in a nursing home in Stowmarket, near to where their son Ray took on a farm at Bildeston, between Hadleigh and Wattisham. Old Wivenhovians will remember Claude’s father as having provided land for Wivenhoe Football Club to play on for a while early in the 1900s and Claude later provided land at Cross Farm for this purpose too. The Wivenhoe Allotments and Gardens Society held many shows using marquees at Cross Farm, courtesy of Claude. In an age before colour television, common ownership of the motor car etc, the Wivenhoe Show was always a big affair and a major event in the Wivenhoe calendar. Claude was one of the founders the Bowls Club which was started in April 1926 on land behind Fernbank in Wivenhoe High Street. In 1947, Freda was one of the founders of the Ladies Section and remained a prominent member of the Club throughout her life. She and Claude are still very much remembered by the Bowls Club. Freda was also well known for her excellence in needlework, making items for sale in the village for various causes. Their son Ray was an active member of the Wivenhoe Cricket Club and Wivenhoe Rangers Football Club before leaving Wivenhoe in 1952 to take up farming in Suffolk. 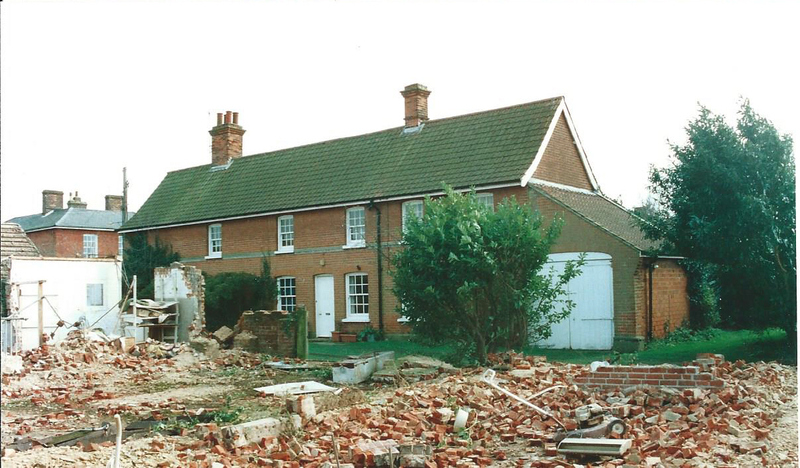 People living in Wivenhoe from the 1970s onwards, when Claude gave up actively farming at Cross Farm, will remember him as the old boy with the black beret or a cap, who used to hand dig the large piece of ground by the side of the farmhouse. Each year he used to grow potatoes and all types of brassicas in this large plot. Those who knew him were always treated to a cabbage if they stopped to wave although conversations with him were always a little difficult because of his hearing problem incurred as a result of the first World War. 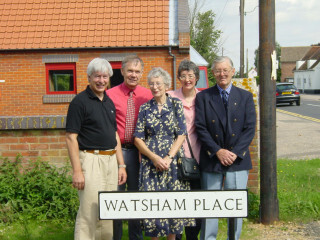 For much of the twentieth century, the Watshams had made their mark on Wivenhoe. Frederick Watsham had bought Vine Farm in 1902 and his son Claude had become tenant farmer across the road in Cross Farm. They were more than just farmers in Wivenhoe; they contributed a lot to Wivenhoe in other ways. In 2000, with the demolition of the barns and the building of several houses by Cross Farm which required a road to be built, I thought it would be fitting that it be called Watsham Place to recognise the contribution of the Watshams to Wivenhoe’s evolution in the last century. As a Councillor on Wivenhoe Town Council I proposed that it should be so named and it went forward to Colchester Borough Council and the Post Office for their approval. 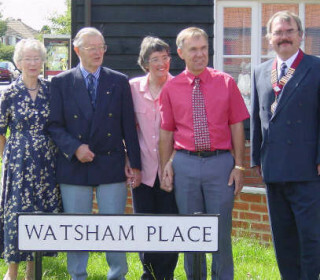 On 11th August 2001 the road was officially named Watsham Place by Mayor of Wivenhoe, Cllr Steve Ford with Mr and Mrs Ray Watsham present, his daughter Rowena and her husband, local councillors, friends and members of the Wivenhoe Bowls Club. Following this little ceremony, everybody was invited back to the home of Peter & Bonnie Hill, Toad Hall, for refreshments, and to reminisce.